Don’t Call Me Old, I’m Just Awakening! Sinetar pioneered a baby boomer self-help movement with her [books on vocation]. Now, Sinetar heads up another trend: high quality of life for aging baby boomers and elders. 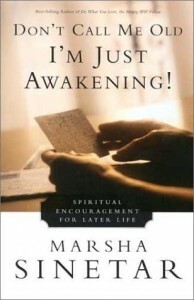 In her latest book, Don’t Call Me Old, I’m Just Awakening: Spiritual Encouragement for Later Life, Sinetar examines “successful aging” from a socio-spiritual perspective. Originally designed as a part of her leadership development programs for gerontologists and health-care workers, Sinetar evolved her ideas into the concept of spiritual hardiness — a crucial component of successful aging. Sinetar has detected the emergence of another mega-trend, as she proposes higher consciousness for a vibrant later life as well as a total overhaul for a global eldercare system straining to serve while weighed down with outmoded ideas. For two decades, Sinetar, a Christian contemplative has been researching diverse expressions of higher consciousness. In Don’t Call Me Old … she contrasts our often drab, self-defeating and erroneous assumptions about aging with the potent, meaningful perspective we could have if we adopted both ancient and 21st Century alternatives, encouraging one another along these lines.